Photo and caption courtesy of Pat Fines. This end property is the one that housed Pat Fines' shop. The different brick tones clearly evident in the enlarged version of this photograph, taken by Paul Bexon in 2004, indicate where the original shop frontage was situated. This photograph, taken by Peter Holland in 1978, shows Mettham Street looking towards Lenton Boulevard. Frederick Grove lies off to the right. 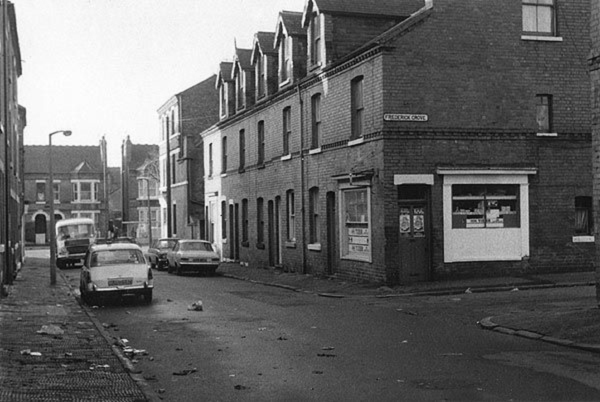 As this shot shows there was another corner shop on the opposite corner. 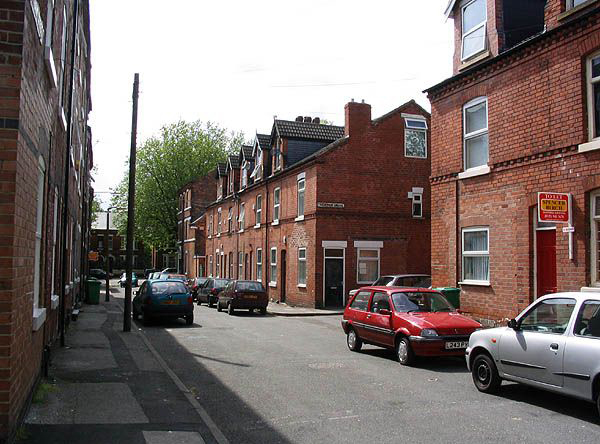 This 2004 shot is also taken looking along Mettham Street but the photographer is now standing at its junction with Harley Street. The property shown in the 1978 photograph is still clearly with us but the shop frontage was removed a few years ago. I was born at 11 Mettham Street in March 1941. My grandparents, Gordon and Dorothy Fox, were the tenants but my parents, Ted [John Edward] and Renée Terry had come to stay with them when my birth was imminent. They had lived on Albert Road and we moved back there after I was born but moved in permanently with my grandparents not long afterwards. 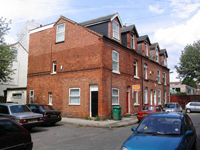 I then lived at 11 Mettham Street until my marriage in 1960 when I went to live in Long Eaton. The house was strange in that, unlike every other house on the street, we didn't have a front door facing on to the street. Our 'front' door, which we never used (preferring to go in and out via the back door), was on the side of the building part way down the passageway. 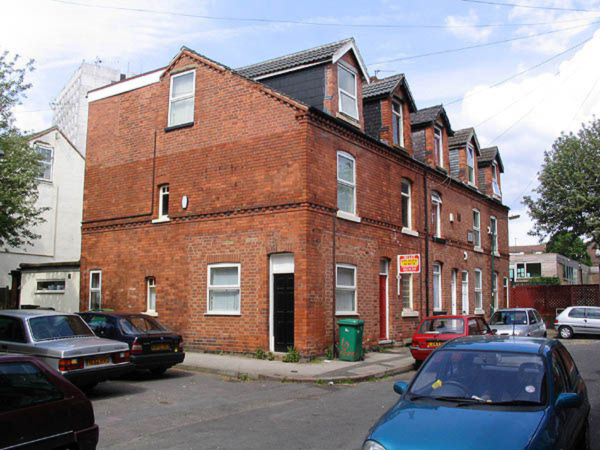 I was told that this was because it had been originally intended that our house should front on to Lenton Boulevard, but the builder didn't keep to the plans and subsequently built the other row of houses in front of No.11. I can recall some of our neighbours. At No.9 was a Mrs Hallam while at either No.5 or No.3 were the Brownings. Next to us at No.13 were the Godfreys and next to them at No.15 were the Slacks. Across the street from us, probably at No.12 were the Beaumonts with a daughter called Norma. The two shops either side of the alley leading up to Frederick Grove were a general & greengrocers and a fish and chip shop. 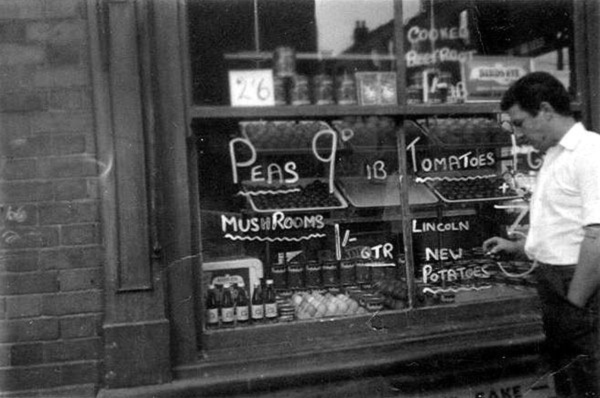 Reg and Vida Slack ran the grocers shop until the early 1950s when they retired to a bungalow in Lambley. My parents were very friendly with them and we were invited to visit them at the bungalow. I still have a prayer book they gave me for my tenth birthday in 1951. The fish and chip shop was run by a Mr & Mrs Esden, for as long as I can remember. At the bottom of Mettham Street at its junction with Lenton Boulevard, were shops on either corner. On the right was a general grocer selling more upmarket goods than the shop further along Mettham Street and this was patronised by the 'posh' folk. On the other corner was my grandmother's second-hand shop with the details of my uncle's [Birley Fox] wedding cars and taxi business displayed in the front window. His brother, Frank Fox, also had a taxi business which he ran from his home in Hart Street. At the top end of Mettham Street where it turns right into Harley Street were the Artesian well sinkers – Cooke's, I believe. There was always a lot of noise coming from them during the day and I don't know how the family who lived in the house next door put up with it. I think their name might have been Keen.